The most important priority of the Harpocrite government was wait times, and well we are still waiting to see what will be done to reduce them. So far the New Government gets a big F for failure from those in the know. A survey of Canadian doctors has given the battle to reduce health-care waiting times a marginal or failing grade. The combined efforts of governments to address wait times in targeted areas earned a D (poor) or F (very poor) grade from 57 per cent of respondents. Only 13 per cent felt the effort was producing excellent (A) or good (B) results. "In other words, the priority in some areas is causing ... less priority in other areas," says association president Dr. Colin McMillan. So outspoken Liberal government critic Auditor General Sheila Fraser has fired the Environmental Commissioner, Johanne Gelinas, a political move do ya think. Of course. Sheila who herself has been critical of the Liberals always seemed to address the Conservatives favorite pet peeves and gave them ammunition to attack the Liberals. Hmmm funny that. Johanne Gelinas would have been as critical of the Harpocrites as she had been of the Liberals, and we certainly can't have that. Green Party Leader Elizabeth May, a longtime friend of Gelinas, said her departure has been in the works for months. "It's been coming for some time. Ever since she filed her report on climate change there have been attempts to shut down her office and curtail her role," May said. So did Sheila do Harper a favour and fire Gelinas in order to give the Tories plausible deniability. Inquiring minds want to know. And socialism in Cuba will not collapse with the passing of Comrade El Comandante Fidel. 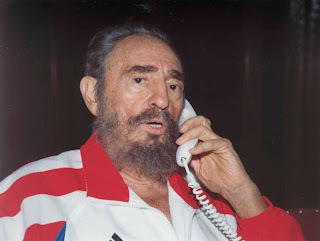 Castro, 'El Comandante', is most often known to his people as 'Fidel', even to his face. They 'argue with him, they claim him', writes Gabriel Garcia Marquez. Vote for the Labour Website of the Year 2007! Voting ends tonight at midnight. And yes you can vote for this blog by clicking on the link in the sidebar. Hint, hint. Labour WebSite Of The Year-A Blog? And so the reason for the rush to judgement on Income Trusts? Why they booted Garth Turner out of caucus only the week before. And then they adopted his policy on Income Splitting which they had denied was a priority prior to October 31. It is all political optics. In an attempt to appease upset investors, the government said it will increase the seniors tax credit and allow income splitting. “Pension income splitting is a major positive change in tax policy for pensioners and seniors,” Flaherty told the committee. Because so far Flaherty has not come up with any more evidence of Income Trust impacts on the tax system than what his Liberal predecesors had found. Suspicious that. Of course the rush by big Canadian corporations to become income trusts and avoid corporate taxes caught the Tories off guard. The boys on Bay Street gave them the bums rush so they returned it in kind. Caught off guard they rushed to judgement and gave Bay Street a Halloween trick while promising retirees and seniors a special treat; income splitting. This is the key element of the Conservatives tax fairness plan; Garth Turners idea of Income Splitting. Which is neither fair nor good policy, but like the GST cut it is good political optics. However like the Income Trust policy it is still only speculative. Income Splitting is not a reality, yet. Lobbyists suggest the signals are strong that the minority government could muster enough support for pension-splitting plan. But getting it passed may be complicated because it is likely to be treated as part of a package of measures that includes its controversial plan to phase out tax breaks for income trusts. Those advocating for income splitting are the same right wing lobbyists like REAL Women, who lobbied for the Tories Child Tax Bonus and opposed daycare funding. They want tax credits for living at home moms with kids. That is they want taxpayer to pay for wealthy folks who can afford not to work two jobs. They do not want to pay for other folks daycare being the greedy parasites they are. A 34-year-old Kemptville, Ont., woman with three kids at home and a husband commuting to a computer job in Ottawa is the chief organizer for the Parliament Hill conference Turner hosts Tuesday. Sara Landriault, national coordinator of Care of the Child Coalition, says spouses who care for children at home, the vast majority being women, should be paid through the tax system for their work. She acknowledges a sobering fact a sobering fact Turner himself discovered in a research paper he commissioned from the Library of Parliament. Though he calls the income-splitting scheme a tax reform for the middle class, the library document shows it is actually the upper - maybe upper-upper - classes that would benefit most. "Sure, they pay more taxes, they're going to get more of it back," says Landriault. And that doesn't even take into account lone-parent families, the majority of whom are headed by a woman and many of whom live below the poverty line, says Martha Friendly, one of Landriault's staunchest opponents and co-ordinator of the Childcare Resource and Research Unit at the University of Toronto. "Low-income single mothers, they don't get anything out of this," says Friendly, noting with apprehension that Turner's own research shows the move would take $5 billion out of federal revenues when it's combined with income-splitting for pensioners. "It's cutting taxes for people who have more money." Critics of the idea also point out it will do little or nothing to help low-income singles or couples who arguably need help the most. But John Williamson of the Canadian Taxpayers Federation stresses that higher-income couples shoulder a disproportionate share of the tax burden.The weight is especially heavy for single-earner families. Well duh they earn more they should pay more taxes. But of course that's the right wings definition of class warfare, taxing the rich. Because only those who are wealthy can afford to have an unemployed spouse living at home. You may have heard the recent news from the Census Bureau that as of 2005, and for the first time in recorded history, more than half of all adult women are living without a spouse. There are plenty of implications that arise from this latest finding, but as the New York Times points out, contrary to popular perception, this so-called “marriage gap” isn’t about gender, but instead, it’s about education and social class -- women with lower socioeconomic attainment are less likely to marry than women with higher socioeconomic attainment. And to add insult to injury the folks who will benefit the most from income splitting of pensions will not be widows, the largest group of single pensioners in Canada and the poorest, or the average working class family but those who can afford to retire early or retire and continue working. Tax relief -- at what cost? Income-splitting is a vote-getter that would save middle-class families billions of dollars a year in taxes, but experts say that doesn't make it sound fiscal policy. MPs inside and outside the Conservative party are urging Prime Minister Stephen Harper to lower taxes in his upcoming budget by allowing couples to combine their incomes and divide the tax load. Some experts are saying the cost of income-splitting -- anywhere from $3 billion to $5 billion a year -- could blow a hole in the nation's finances. Tax fairness is rhetoric for tax breaks for the rich and wealthy in Canada. Rules for this year's biggest financial-planning treat will discriminate in a tricky and illogical fashion among those who have yet to turn 65. That the treat is tricky may explain why Finance Minister Jim Flaherty chose Halloween to announce his plan, but not why he used the term "tax fairness." He plans to let many couples save taxes by splitting income more equally between the two partners, starting with 2007 tax returns. This golden opportunity will not be restricted in a simple fashion to those of a certain age, income or work status. Instead, eligibility will depend on the type of income. This is unfair. At one extreme, we could have a former deputy minister splitting pension income as early as age 55, while also collecting a pay cheque from a new job. Yet, an unemployed retiree who never contributed to a pension – or was forced out before qualifying – would have to wait until age 65 to split income. Basically, you would need to receive monthly payments directly from a registered pension plan, or be receiving income as the surviving spouse of a deceased member of a pension plan in order to split income with a spouse or common-law partner. Here's how a finance department spokesperson explained the rationale for discriminating on the basis of income type, rather than a person's age, employment status or, say, one's eligibility for a lifetime income. "The purpose of the age 65 requirement is to target the pension income credit to retired individuals. Individuals have much greater personal control" over when they withdraw money from registered retirement savings plans, registered retirement income funds and life income funds as opposed to registered pension plans. "Without the age 65 eligibility rule, many individuals who are not retired could gain significant tax advantages well before they attain age 65 by arranging to withdraw money each year as RRSP annuity or RRIF income while still saving for retirement. "Individuals in receipt of (registered pension plan) income, on the other hand, generally have little control over the timing of their pension payments; they usually only receive such payments when they are retired." The problem with the line of reasoning is that many pension recipients can and do retire before age 65, and they can and do find new jobs. That can particularly include former police officers, teachers, armed services personnel and civil servants. They collect both a pension and a paycheque or consulting fees. Meanwhile, others who do not collect a pension could find themselves unemployed and having to rely on their savings. Another example from the work of Herr Doctor Marx; the reserve army of the unemployed.....capitalism requires cheap labour and the state cannot do anything about it except continue to provide it. Income levels of new Canadian immigrants did not improve after 2000 even though they were better educated and more skilled than people coming to the country a decade earlier, Statistics Canada reported Tuesday. The report found the large increase in education of new immigrants and a policy shift that prefers the skilled class immigrant had only a small impact on improving new immigrant income levels. Vista, Microsofts new flawed operating system is an expensive memory hog. Which means that you will have to get a new computer to operate it. Clever marketing ploy that. So just wait a couple of years and the next computer you buy will be powerful enough to have Vista installed on it. "WE NEED MORE SMART FEMALE BLOGGERS NOW!" Yes he did scream that loud. And yes he did say smart. As in not a moron as he likes to call some of us, female or male. Oh yes and he likes to call folks crypto-fascists and anti-semites. Gee Warren I guess that makes you a DUMB MALE BLOGGER for such a stupid sexist statement. Is it because Warren is a rock star? A columnist with the National Pest? A nice guy? The biggest egoist in the Canadian Blogosphere after Kate at SDA? Nope its because he is a Liberal and his top ten list was all fellow Liberals and most of the response is coming from fellow Liberalbloggers whom he insulted by his ignorance, his ignorant list and whom he ignored. He made a sexist list and then made a feeble attempt to excuse the fact that he FAILED TO INCLUDE MORE THAN ONE WOMAN BLOGGER ON HIS TOP TEN LIST. And she is an obscure one at that. And instead of being blasted for his sexist attitude is inundated with faint praise and lists of favorite female bloggers. Go figure. These new Conservative attack ads are very clear about the message they try to get across, but like many of their ads during the past campaign, they look pretty low-budget, something that a lot of people can put together and send out using YouTube. I guess what they saved in production costs they make up for in placement costs, the ads will cost the party a pretty penny if they ever make it on the Superbowl. Adam Daifallah is promoting the rise of the new right in Quebec as if it was a libertarian movement when in reality it is just so much of the same old, same old neo-con job. As I posted in his comments if he really wants a libertarian solution to Quebec statism he would promote workers control of their workplaces and worker cooperatives. But of course that is not what these dweebs are suggesting at all. Bill Hall of the local CKWS News, Youth for Liberty member Adam Daifallah and Paul Quick (one of the counter-demonstrators) take advantage of a photo-op during the Walk for Capitalism in Kingston, Ontario, Canada. Opps guess we might not be seeing the Conservative attack ads on the Superbowl after all. The television ads, which began airing Monday, use footage from last fall's Liberal leadership debates to deliver the message that the new Grit leader is weak, indecisive and an environmental failure. But that footage belongs to a consortium of TV networks which pooled their resources to provide live coverage of the debates. The Cable Public Affairs Channel provided the pool camera for each debate. The networks are now looking into how the Conservatives obtained the debate footage for their ads. Van Dusen said he is not aware of any request by the Tory party to buy or use any portion of the debate videos. "It would come through me and I certainly don't remember ever getting a request," he said, adding that he "would've said no" if he had received a request. A tip o' the blog to My Blahg. Well they were slow off the mark but here is yet more predictable right wing bashing of Maher Arar, from our favorite wingnuts at the Western Slander. The running joke among many Afghanistan is not whether you'll be given a shakedown when passing through a checkpoint, but how much will be extorted from you. There have been reports, near the village of Senjaray, that the roadblocks are run by uniformed Afghan National Police officers - something that sullies the force's already blackened reputation. Irritated citizens also claim a powerful, former militia commander-turned local politician is behind the racket. "Like everything else, people will say the governor is corrupt; OK show me," said Lt.-Col. Simon Heatherington, whose assignment ended Monday. "It's like saying (in Canada) the prime minister is corrupt; OK show me. 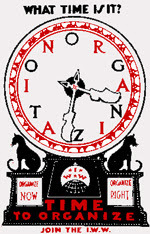 Here is an interesting post on the need for 'free democratic worker controlled unions' not state controlled workers associations. How U.S. and other global corporations utilize government-controlled unions created by authoritarian nationalist regimes even as they claim to be liquidating the legacy of those regimes in the interest of economic freedom. Begins today. I guess these folks won't be voting for Harpers Conservatives. Whether CAITI actually represents trust investors is debatable. One witness appearing tomorrow, independent consultant Dianne Urquhart, says the association is in reality sponsored by trust vendors and the law firms and accountants supporting them. They are trust "investors" only to the extent they invest in their own product. And the FP to its credit points out, as I have here the concerns that Income Trusts were always a ponzi scheme, benefiting fund managers and owners more than investors. Contrary to what the spin masters would have us believe, not all pensioners are opposed to the government's decision to tax trusts. The National Pensioners & Senior Citizens Federation, which speaks on Thursday, supports Flaherty's decision. Its 450 chapters and clubs represent a million seniors and pensioners, including the 300,000 members of the United Senior Citizens of Ontario.Even before the Halloween decision came down, the NPSCF was concerned about "income trusts being sold to seniors on the basis of cash yields that are inaccurate, inflated and misleading." What the Liberals should have done and didn't and what the Conservatives promised not to do, but did, affected investors, sure, but only a small number of well off seniors. Canadian seniors who have been screwed by Income Trusts should remember the financial term used for these kinds of investment; high risk. This is not the same kind of rip off seniors in Alberta faced under the Tories in Alberta in the eighties (during the last big boom) when Dial Mortgage Abacus-Cities and Principal Trust collapsed. Those were avoidable and had been backed by the Alberta Treasury Branch as well as the Government. Yet when they collapsed seniors were left holding the bag. What keeps getting lost in all this brouhaha is that Flaherty is promising business another tax cut to make up for taxing income trusts. That's the real meaning behind his euphimistic "Tax Fairness". Nothing fair about it. Just another government handout to those who already have the upper hand. The right wingers at the Blogging Tories have labeled NDP Leader Jack Layton "Taliban Jack"
Ever since the NDP Convention passed a motion calling for the withdrawl of Canadian troops from the Southern Offensive in Kandahar. Layton and the NDP proposed putting them back in Kabul overseeing and protecting reconstruction projects andthat Canada promote peace talks in the region. Peace talks giggled the right wing with glee, as the Liberals and BQ joined in the chorus denouncing the NDP. Maliki's Shiite Iraqi Government orchestrated a deliberate slaughter of Muslim heretics this weekend in Iraq. Iraq and the region is home to many diverse atavistic cults, including Sufism which is a form of Shia'ism. The Sufi's influenced the Gnostic Islamic heresy of the Ishmali's. The idea of eliminating clerics and politicians who represent the estabilished powers is as old as the Shi'ite Cult of the Old Man of the Mountains, Hasan ibn Sabah and his Hassain (cult of the Asssassins). Who was one of the founders of the Ishmali sect. Hasan ibn as-Sabah was thus the original “Old Man of the Mountain,” preceding his namesake Rashid ed-Din Sinan by a hundred years. He also founded a secret religious brotherhood of which he termed himself “grand master” and which aimed, in the words of the Arab historian Philip Hitti, “to emancipate the initiate from the trammels of doctrine and encouraged him to dare all. Below the grand master stood the grand priors.…the lower degree of the order comprised the fida’is, who stood ready to execute whatever orders the grand master issued.” If the word feda’i, or “self-sacrificer,” rings a bell, it should. It’s the singular of “fedayeen,” a term coined by Hasan ibn es-Sabah and widely used in Arabic to this day to describe irregulars fighting for an Arab cause. It’s a favorite of the Palestinians and also had wide currency during the recent fighting in Iraq. Shiite Cult Aimed to Kill Clerics in Iraqi City Abdul Hussein Abtan, the deputy governor of Najaf province, gave an interview to Iraqi television from the battlefield, saying he was standing next to the dead body of the group’s leader. Mr. Abtan said the dead man had claimed to be the Imam Mahdi — the missing spiritual leader whom many Shiites believe will return someday to restore justice. Mr. Abtan described the movement as “an ideological and military organization with long experience,” and said that its leaders came from outside Iraq. He said it was relatively small, but had rallied a large group of “naïve people” over the past two days by proclaiming the return of the Imam Mahdi. They said the group, calling itself the Mahdawiya, was loyal to Ahmad bin al-Hassan al-Basri, an Iraqi cleric who had a falling out with Muhammad Bakr al-Sadr — father-in-law of the Shiite leader Moktada al-Sadr — in Hawza, a revered Shiite seminary in Najaf. The fighting around Najaf centered on a date palm orchard near the village of Zarqaa, about 120 miles south of Baghdad. The village is alongside a river and a large grain silo that is surrounded by orchards, the officials said. The clash appeared to be one of the deadliest battles in Iraq since the American-led invasion four years ago, and it was the first major fight for Iraqi forces in Najaf Province since they took over control of security there from the Americans in December. Nearly 400 people were in Iraqi army custody and 250 were killed, an Iraqi military source said. Government spokesman Ali al-Dabbagh put the number of dead at 150 to 200. There had been women and children in the camp but it was not clear how many were among the casualties, National Security Minister Shirwan al-Waeli told Reuters. "One of the signs of the coming of the Mahdi was to be the killing of the Ulema (clerical hierarchy) in Najaf," "He claimed to be the Mahdi," Waeli said of the cult's leader, adding that he had used the full name Mahdi bin Ali bin Ali bin Abi Taleb, claiming descent from the Prophet Mohammad. Among previous violent instances of people saying they are the Mahdi were an opposition movement to British imperial forces in Sudan in the 1880s and a group of several hundred, including women, that took over the Grand Mosque in Mecca in 1979. This incident reminded me of the slaughter of the indigenous native resistance movement in North America known as the Ghost Dance. The parallels are striking, for the occupation of Indian country had been accomplished and this was the final resistance movement. The Sioux began performing the ghost dance in 1890 after large herds of buffalo had been killed off. They believed this magical dance would bring back the buffalo and eliminate their white enemies. But white Americans became frightened of the ghost dance and demanded protection, leading to the Wounded Knee. In early October of 1890, Kicking Bear, a Minneconjou, visited Sitting Bull at Standing Rock. He told him of the visit he and his brother-in-law, Short Bull, had made to Nevada to visit Wovoka. They told him of the great number of other Indians who were there as well. They referred to Wovoka as the Christ and told of the Ghost Dance that they had learned and the way that the Christ had flown over them on their horseback ride back to the railroad tracks, teaching them Ghost Dance songs. And they told him of the phophecy that, next spring, when the grass was high, the earth would be covered with new soil, burying all the white men.The new soil would be covered with sweet grass, running water and trees; the great herds of buffalo and wild horses would return. All Indians who danced the Ghost Dance would be taken up into the air and suspended there while the new earth was being laid down. Then they would be replaced there, with the ghosts of their ancestors, on the new earth. Only Indians would live there then. This new religion was being taught at all of the Sioux reservations now. Big Foot's band, which consisted mostly of women who had lost their husbands and/or other male relatives in battles with Custer, Miles and Crook, would dance until they collapsed, hoping to guarantee the return of their dead warriors. Sitting Bull greatly doubted that the dead would be be brought back to life. 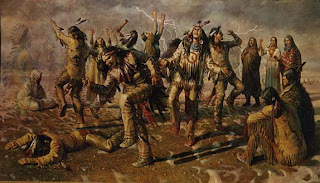 He had no personal objections to people dancing the Ghost Dance; however he had heard that the agents were getting nervous about all of the dancing and were calling in the soldiers on some reservations. He did not want the soldiers to return to kill more of his people. Kicking BearGhost Dance shirts, painted with magic symbols, the soldiers bullets would not strike them. Sitting Bull consented to Kicking Bear remaining at Standing Rock and teaching the Ghost Dance. 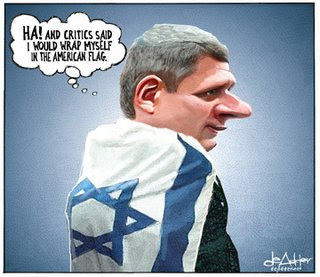 Remember His Highness Stephen Harper saying that Israel's war with Lebanon last summer was a measured response. And after that he was silent on any Israeli war crimes. Insisting even at the Franco-phone summit that a motion critizing Israel be muted and include criticism of Hizbollah, by inference blaming them for starting the war. And then Peter Mackay was in Israel last week saying the New Government of Canada stands by its new found ally. Israel may have violated agreements with Washington on the use of US-made cluster bombs in its war with Hizbullah in Lebanon last summer, the state department said today. this year's Super Bowl commercials add a new twist --One of the biggest new themes of this year's game is getting amateurs into the act. While those reviews have focused chiefly on Vista's new functionality, for the past few months the legal and technical communities have dug into Vista's "fine print." Those communities have raised red flags about Vista's legal terms and conditions as well as the technical limitations that have been incorporated into the software at the insistence of the motion picture industry. The net effect of these concerns may constitute the real Vista revolution as they point to an unprecedented loss of consumer control over their own personal computers. In the name of shielding consumers from computer viruses and protecting copyright owners from potential infringement, Vista seemingly wrestles control of the "user experience" from the user. While the NDP in Canada is challenging the immoral usury of bank service charges and ATM charges, in the U.S. the Democrats in the Senate are also challenging the big bank oligopolies and the immoral usury charged on Credit Cards. 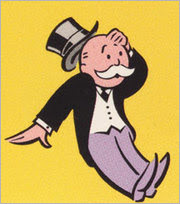 I hope in Canada the NDP will expand its challenge to the Banking Monopolies to include their collusion over credit cards, as well as service charges and ATM fees. Just as I would hope the Democrats in the Senate would expand their credit card investigation to also include service charges and ATM fees. Credit cards have become a ubiquitous and indispensable part of the culture, with an estimated 640 million cards in Americans' wallets and more than $1.8 trillion charged on them in 2005. Many depend on them to pay their bills and buy groceries or gasoline. But consumer groups and other critics say that fees are excessive and that information provided to consumers is confusing. A study by congressional investigators released in October found that fees for paying credit card bills late averaged $34, up from $13 in 1995, while some card issuers impose penalty interest rates of more than 30 percent on consumers who pay late or exceed the credit limit. _Some credit card issuers use a billing method that charges interest on credit card debt already paid by the consumer. 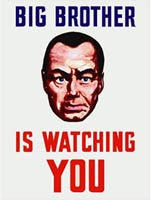 _The massive solicitations mailed to consumers _ an estimated 6 billion in 2005 _ and targeting of college students and the elderly.